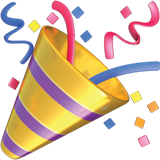 You’ve just landed a customer who has signed a $20,000 contract for the next year — $10,000 now, $10 ,000 in 6 months. You go around your team asking how this changes your metrics. 4 people, 4 metrics, 4 opinions. In particular, your marketing team looks at your finance team and wonders what planet they’re on. How can the numbers look so different, and who’s right? Is it the product and marketing people with their MRR metric, totaling how much revenue is coming into your company, or your finance department, using the revenue recognition principle to calculate their revenue numbers? In fact, you need all these metrics to quantify and develop your business. And if you don't get everyone to understand these metrics, it will lead to confusion and conflict in your business, as different teams go off and calculate different metrics, arguing over who is right about the state of the company. Here we’ll tell you the main difference between SaaS and GAAP metrics, why you need both, and who on your team should own each so that you know exactly how your company is built and where it’s heading. 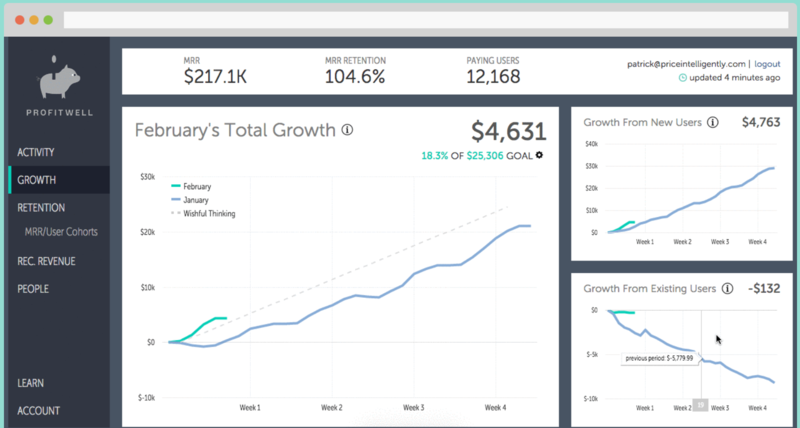 Your SaaS metrics tell you where your business is going. They tell you all about your growth and your momentum. But GAAP metrics tell you where you are now. How well you’re delivering your service, and whether you have a solid foundation on which to build your growth machine. "SaaS metrics show where your business is headed: GAAP metrics tell you where your business is now"
You need both to build a truly successful SaaS business. So what is GAAP accounting? GAAP accounting works on the principle of revenue recognition. Though a contract might have been signed and the money wired to your bank account, you don’t get to count that as revenue until you've earned it. To earn it, you actually have to deliver the service you promised. That 'delivery' aspect is the foundation of GAAP accounting. In traditional software companies, delivery of the software was a one-time deal. You delivered the software in a single delivery, were paid, and could recognize the revenue immediately. For a SaaS company, however, the delivery is ongoing. You are delivering a portion of your software every day throughout your customer’s subscription period. Delivery in this case could mean having your app available to customers throughout their subscription period, as well as delivering consultancy services, support, or anything else you agreed, making earning revenue and delivering your service more complex and an ongoing concern. If you get paid to provide a service for a month or a year, though you receive the money immediately, it can only be recognized as revenue gradually, each month that you provide the service for the prescribed time. When things are simple, GAAP and SaaS metrics look similar. If you are recognizing revenue monthly (technically, it should be rated daily for the period you are delivering the service) then your revenue and MRR will likely be identical. 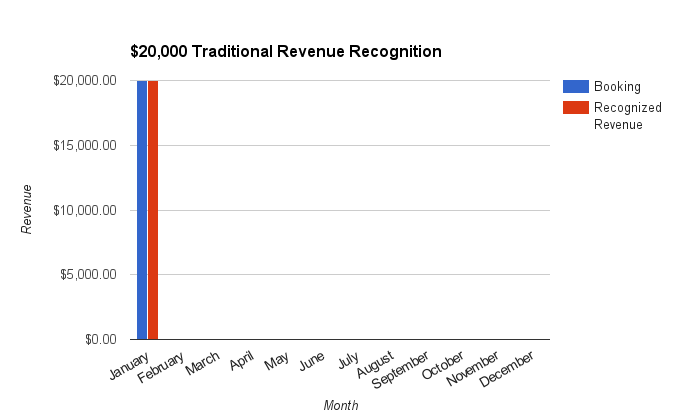 In the above example, the monthly recognized revenue and the MRR are both $1666.67. But once you pick up more accounts, start offering annual payment options, long-term enterprise accounts, discounts, and staggered invoicing schedules, your finances can get very complicated. Once you are bundling services, with payments and services due at different times, you’ll find that your SaaS and GAAP metrics will be different. Add that to what happens when you don’t deliver for a customer — when people have paid for your service and you have their money, but you haven’t earned it. If your server is down for an extended period of time, or you cancelled the consultancy service, for example. Then you have to either pay the money back, or accrue added expenses in order to deliver the service. If you don’t have a way to discern earned income from income you have yet to deliver on, you won’t know exactly what you still have to do, or how much you still have to invest, to make your customers happy and earn that money. This is why you need to know the exact difference between your bottom-line revenue, the cash in your bank account, and your sales and MRR numbers, as well as how all of these numbers interact as you grow. There are 5 main SaaS and GAAP metrics: Bookings, MRR, Recognized Revenue, Deferred revenue, and Cash Collections. This is the total value of all of the items with a revenue implication that have been ‘booked’ as sales. A contract isn’t neccessary for an item to be booked, and it could include all of the subscription fees that you charge, either yearly or monthly, and also variable fees that you charge (for over usage or transaction fees), along with any one-time fees, or service fees. This metric does appear in your financial statements, but as a SaaS metric, its definition is down to interpretation. You can decide what is included in your bookings and what isn’t. Some businesses might count only yearly plans as bookings, but not monthly recurring plans. Others will want to include add-on services that are one-off fees, while others will only have recurring revenue. Primarily though, this is how much your customers have committed to spend with your service. This is the first point that revenue is going to be showing in your business and it’s a signal of how much revenue you are going to eventually have coming into your business, if you deliver what is promised. Monthly recurring revenue (MRR) is a measure of all of the recurring revenue from subscriptions that comes in each month. It might be from monthly plans, or could be from yearly plans amortized over 12 months into monthly revenue. As yearly plans are a great way of increasing your cash flow, most services will offer a discount for customers who sign up for a year in advance, usually one free month or 10% off. But this would increase short-term cash flow, which is vital to the growth of your company, allowing you to invest in product development, hire new talent and expand your service. 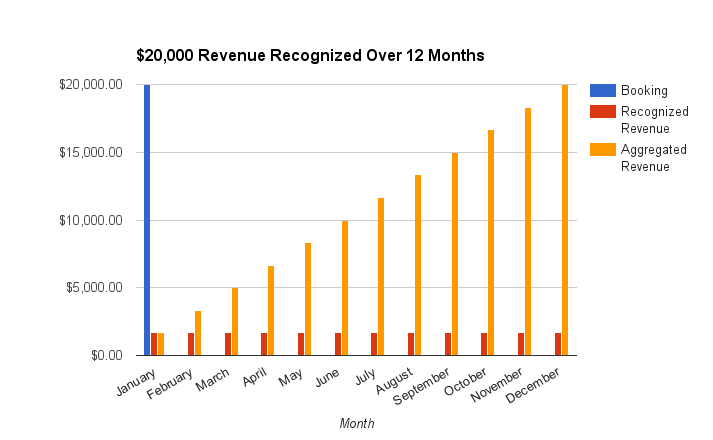 What is important with MRR is that it is only the predictable revenue that comes every month, not one-off fees or other charges. As a subscription SaaS company, you need a way to track subscriptions specifically and separately from other revenue, as these are the backbone of your business. MRR should be further broken down into MRR from new customers each month and from expansive MRR, where customers have upgraded their plans. You can also track churned customers through MRR, breaking down MRR into cohorts and seeing where you service is failing. Recognized revenue is the revenue you receive from delivering your product or service. When you get to recognize revenue will be set out in a revenue schedule and determined at the start of any contract or billing cycle. Deferred revenue is the inverse of recognized revenue. It’s the amount of bookings that has yet to be recognized. i.e. you haven’t delivered your service in return for that money yet. As recognized revenue goes up, deferred revenue goes down. In the above example, on August 1, $11,666.67 of the $20,000 booking has been recognized, and the remaining $8,333.33 is deferred. 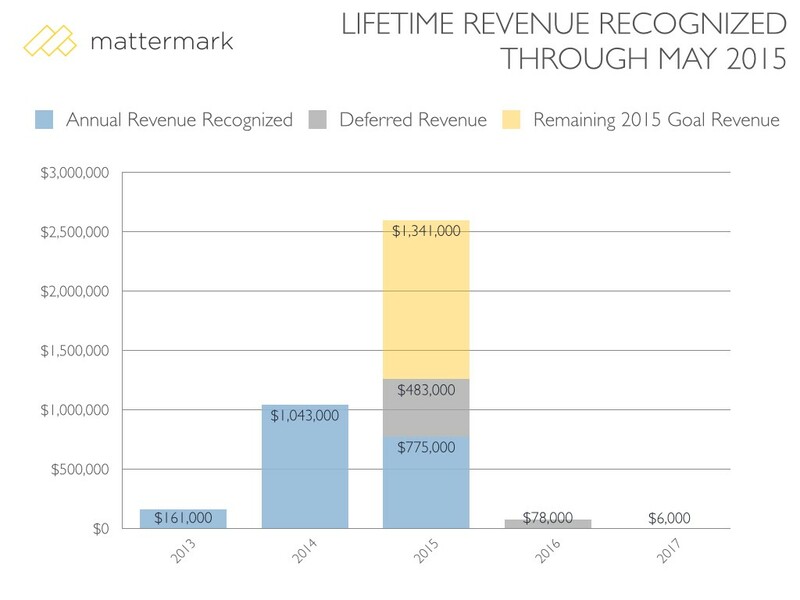 Up until May 2015, Mattermark had recognized $775,000 worth of its revenue, but still had $483,000 of revenue to recognize within the year for services it had yet to deliver, along with $84,000 of revenue that it has already booked for 2016/17. That $775,000 will slowly increase and $483,000 will slowly decrease throughout the year as they deliver their services to their customers and earn that deferred revenue. Cash collections occur when you actually get the money in your bank account from your customer. This cash collection could come at any time and is different from revenue. Cash in the bank can’t actually be recognized as revenue until you’ve earned it. As a SaaS company, you’re probably collecting the money up-front, either as an annual payment, or monthly at the beginning of your customer’s billing cycle. But it's important to understand that this is different to either revenue or bookings. Even if you collections match either of these in the scheduling, they are dealt with differently by the accounting department — for good reason. Each of these metrics needs an owner. This means that there is always a directly responsible individual or team who truly understands that metric and can give you that updated number whenever you ask for it. Each number needs to be tracked, and ownership should go the team or person who needs to know that metric the most, and has the most direct impact on that metric each day. Your sales team's primary metric is bookings. If bookings are going up it’s a sign that your sales team is doing great work, as bookings are a measure of the growth of your sales over time. Bookings are a better metric for gauging your sales success than MRR, as it also includes those one-time fees that aren’t going to be counted in MRR. But sales will also want to keep an eye on MRR, and MRR churn in particular, as this will tell them if they’re selling to the right customers, and qualifying their leads correctly. When you break down your bookings, you can find out how your company is progressing via plans sold, or how well individual sales reps are doing. Each member of the sales team will have a quota or bookings goal to hit, so they need to know the total bookings and how the number breaks down into new customers and upgraded customers. It gives you the ability to discover exactly how well your sales strategy, process and team is working. This is the metric that usually determines your sales team’s compensation plans as well, so it’s the number that guides them every day. They will be more motivated to bring in larger bookings, for example, accounts that pay a large, up-front fee. This can help the company in two ways: by locking in revenue for a fixed term (a year) and by getting cash upfront for an entire years subscription (even if you can’t recognize that cash immediately). However, it’s also important for the sales team to know how much of their bookings are eventually recognized as revenue. If bookings are high but eventual recognized revenue is low, it could be a sign that your product isn’t delivering to standard. By tracking both and seeing how bookings eventually flow into revenue when you deliver to the customers, you get an excellent benchmark of whether you sales process and product delivery are on point. 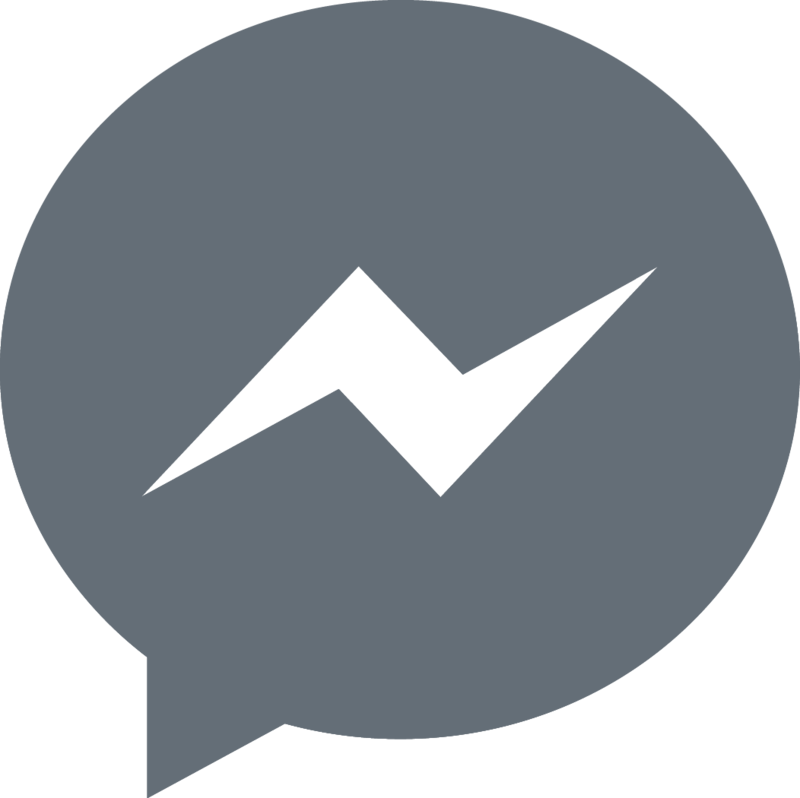 Your product team should own MRR. This is the best guide to the momentum of your company — how it is growing and how fast. Using MRR along with other SaaS metrics, such as MRR churn and LTV, can tell you how your customers are using your service. You can use the information to enhance the service itself, and improve the core value of the product, or introduce new features. As MRR is forward-looking, it gives you the best gauge of what your company will look like a year from now, allowing you to plan your product roadmap and feature development accordingly — and also factor in what needs to be fixed based on MRR churn. Increasing your net customer acquisition: This is all about getting more people into your service, and increasing your MRR through increased customers overall. Increase your expansionary revenue: You can upgrade existing customers, offering them more value from your product. Increase your retention: You can retain current customers by continually improving your product around your value metric, showing the value of your service to them. Reduce your customer acquisition costs: You can reduce your CAC by optimizing your pricing, quickly engaging new customers, and using more effective marketing techniques. It’s important to look at MRR in relation to other metrics, particularly bookings. If you have high bookings but low MRR, then you aren’t providing value to your customers and they are churning out of your service quickly. Accounting’s primary concerns are cash collections and revenue. But good accountants provide far more value than simple bookkeeping. They’re in touch with the financial pulse of your business, and help define your trajectory of growth. Your accounting team keeps track of what’s actually going on with your cashflow and your finances in the present, with all the details you don’t think of in the day-to-day: how and if your cash is actually being collected, and whether your services are being delivered. If you let these details slide, they’ll grow unmanageable and bankrupt your business. Once accounting has a solid grasp of your cashflow, they can start to plan growth strategies and help you reinvest revenue into your company with confidence. Along with the CFO, accountants will work with all the metrics, pulling them together to show the flow of funds throughout your business, from bookings to revenue to cash, and help plan out the finances of your business. They also tell you how cash relates to recognized revenue. It’s easy to get overconfident by high bookings and MRR, but accounting lets you know not only how much you can spend, but how much you actually should spend. For example, if recognized revenue starts to fall below MRR, then this is a warning sign that you're not performing up to standard and delivering what is expected. Your finance team will then adjust your accounts, showing what cash you have to invest in providing a better service and earning the deferred revenue. They'll look at bookings alongside the sales team, so they know when and how money is flowing into the company and can plan accordingly. If you’ve booked a number of accounts, but the terms of the deal don’t have you collecting the cash now, then you’ll have to find other money with which to expand your company and grow. Your accountants will tell you whether you have this money, and where to find it. Alternatively, they can show you that you have good cash flow, and set out exactly what you’re going to be able to afford as you expand your company outwards and grow. Your CFO's main metric is revenue, but she’s going to be looking at all of your numbers all of the time and is responsible for the big picture of your entire finances. In fact, as Zirtual found out to their cost, choosing not to have a full-time CFO in a growing SaaS business can be a catastrophic mistake. Someone with a high level of experience and knowledge is vital to truly understanding your finances. An outsourced CFO won’t understand your business model properly, while others in the company who think they can handle the finances, won’t have the correct training and expertise to manage them properly. This is why, along with the accountants, CFOs are the unsung heroes of the SaaS world. Your CFO can also use this information to design and develop a long-term strategy for the company. By knowing the ebb and flow of your revenues, and tying this back to bookings and cash collections, the CFO is able to predict the cash flows of the company and give detailed information about the actual financial health of your business. In this way, they can tell you whether your business has a firm foundation for any growth and whether your cash flow is likely to rise or fall in the next few weeks and months as more revenue is recognized. Though it’s tempting for young companies to ignore GAAP metrics completely, and even for successful SaaS businesses to relegate them to secondary metrics, understanding how revenue flows through your business is vital for its long-term health. Each element of these metrics gives you a different piece of information, and you need all of them to know the true financial status of the business. What’s important is to get everyone within the company understanding how each of these metrics is important, and how they and others contribute to the success of the business. If you don’t understand how all of your metrics work together, don’t understand GAAP accounting, or how recognized revenue can differ from your other metrics, then you don’t really understand your business and its foundation. Though your SaaS metrics are telling you where you are going with your company, without that foundation that GAAP accounting gives you, you might find that you never get there.